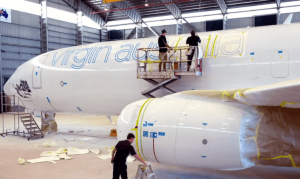 Watching Virgin Australia Strip & Paint a Boeing 737 Is Fascinating! Virgin Australia has released a fascinating video, showing the company strip and paint a Boeing 737. In this particular case, the plane took 11 days, 18 painters, and 260 liters of paint to complete the job, relatively fast when you consider other airlines use robots to do the same job. Here is an example from Boeing demonstrating the capabilities of the company’s 777 ASM robot painters.